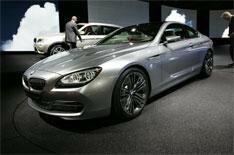 BMW 6 Series concept car | What Car? From its LED headlights to its perfectly sculpted posterior, the 6 Series coupe concept is easily the prettiest thing on the BMW stand at the Paris motor show this year. If you think it looks familiar, that's because it closely resembles the four-door Gran Coupe design study shown at the Beijing motor show earlier this year. This is pretty much how the next BMW 6 Series will look when it goes on sale next year. The convertible version of the car is expected next spring, followed by the coupe later in the summer. The four-door flagship version is expected sometime in 2012. The coupe and convertible are around the same length as the current model, but wider and lower. There are no details on the engines to be used in the new car, but you can expect efficient, high-output petrol and diesel drivetrains as well as super-fast range-topping M models. Prices are expected to start at around 55,000.